Father's Day Gift Ideas: Let's Get Creative This Year! It’s June, which means Father’s Day (June 18th) is almost upon us. This year, don’t give Dad yet another boring tie, get creative with some of these great Father’s Day Gift Ideas. I received a complimentary gift basket from the Kansas City Steak Company and let me tell you – both my husband and Dad agreed that they want this EVERY Father’s Day going forward. Both men in my life consider themselves steak connoisseurs so for them to agree that the quality of these steaks was on par with the best steak houses is quite the testament. As a steak lover myself (rare, please!) I have to agree. The steaks come frozen in a masculine gift box accompanied by the perfect seasoning packet – a simple bled of salt, pepper and garlic – that adds the perfect touch to the grilled steaks. We devoured the Ribeyes over Memorial Day Weekend and we’re really eager to try the fillets this weekend. Ready to order? Wife in Progress readers can get a 15% discount using the WIFEFD17. Orders must be placed by Tuesday, June 13th in order to be received in time for Father’s Day. Head over to Kansas City Steak Company and make Dad’s day! Did you know that Stitch Fix is now styling men? I’ve been getting my own fix several times a year for two years now, and I’m pretty obsessed. I’ve been trying to get my husband to sign up and try it out for several months but he was convinced he would hate the clothes. Well, luckily for him, Stitch Fix waived the $20 styling fee for his first box so that he could try it out risk free. I’m not sure who was more excited when it arrived – him or me. Every fix is like Christmas, seriously! Brian takes pride in how he dresses and is incredibly picking about how things look and fit. Stitch Fix actually got it right on the first attempt, which is pretty amazing (since he won’t even wear some thing I buy for him!). When you sign up, there’s a pretty detailed profile that you need to fill out so that your stylist gets a sense of what you like and don’t like. Along with that, they take all your measurements and any requests you have for specific items. Brian just requested casual weekend wear as he wears suits to work during the week. Ready to give the gift of Stitch Fix to the man in your life? Whether you need to help them come out of their clothing comfort zone or simply add to an existing wardrobe, a Stitch Fix gift card (or the first fix!) is a great Father’s Day gift. Sign up here and get started! 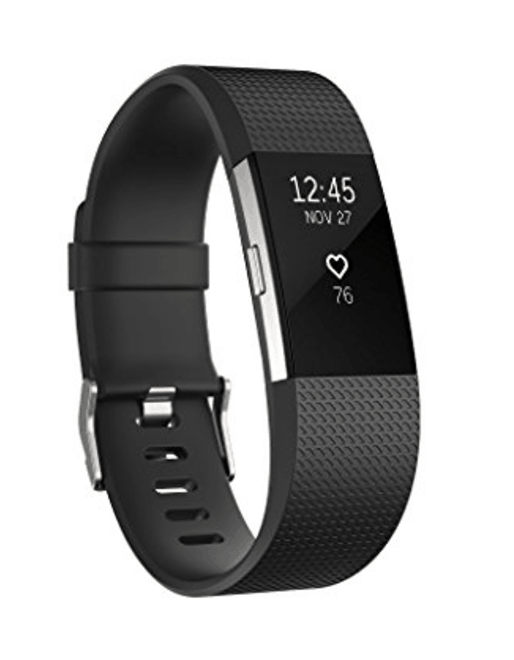 The Fitbit is the gadget du jour and any man serious about exercise should have one. If the dad in your life falls into that category, then this might just be the gift for him! With the Fitbit, you can get a better understanding of your fitness level and see how you can improve over time with a personalized Cardio Fitness Score; Use Connected GPS during run mode to see real-time stats like pace and distance on your wrist. Track all-day activity like steps, distance, calories burned, floors climbed and active minutes. Not only that but you can find moments of calm throughout your day with personalized guided breathing sessions based on your heart rate. Awesome, right? There’s something about personalized items that I love. 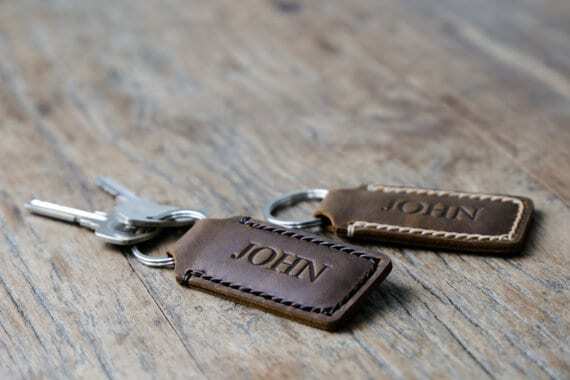 And these personalized, hand stitched keychains are no exception. Not only are they affordable and useful, but they are really classy looking too. Order one for every Dad in your life! Promotional sponsorship provided by Kansas City Steak Company & Stitch Fix.